Finishing Line Press will publish a new chapbook of poems by LC English professor Laura Marello this week. Cover design by Lynchburg artist Brooke Marcy. 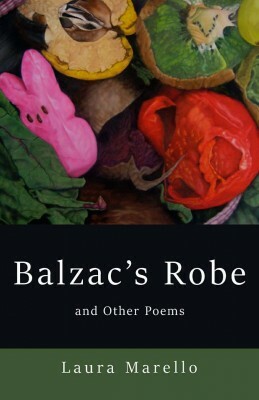 “Balzac’s Robe and Other Poems” will ship beginning March 18. It is Marello’s first published book of poetry. The book consists of 16 poems written over a span of more than 20 years. Marello recently decided to try compiling a book of her unpublished poems, and she submitted a portion of the collection as a chapbook to Finishing Line’s New Women’s Voices Awards, where she took second finalist spot, which includes publication. The earliest poems in the new collection were written in the 1980s. Several, however, came about during Marello’s time teaching at LC over the past 13 years. For example, she wrote “Vin Deisel” for one of her LC students, and “Clean Room” was composed for Dr. Chidsey Dickson while “Fric and Frac2 Fricassée: or the Subtextual Frog” was inspired by a dinner that she and professor Nina Salmon had with an author who came for a Thornton Reading. “Balzac’s Robe and Other Poems” is available on the Finishing Line Press website. Her third published novel, Maniac Drifter, will be released by Guernica Editions in the fall of 2016.